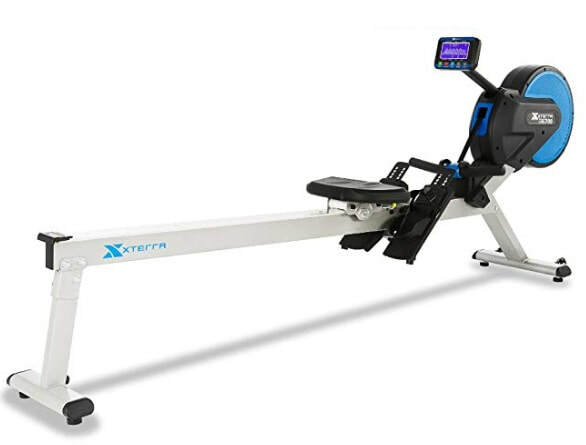 The XTERRA ERG700 is currently the top of the range in this brand's rowing machines. We've tried a number of their rowers over the last five years and have found their models to be reliable (if sometimes a little dull). So what can you expect from this model? Quite a lot as it turns out. For starters, it's quite straightforward to put together requiring around 45 minutes in total. Its sleek, functional appearance is easy on the eye and would look at home in any home gym. The rowing position is great. The wide seat is comfortable and its high position (frame is 20" off the ground) makes it very easy to get on and off - especially after a long workout. The handle is padded and sits comfortably in the palm, the display screen can be adjusted so you can position it at the right height for your vision. The steel frame is incredibly sturdy and sits solid when going full tilt - and it should be as it can support a user of up to 350 lbs. 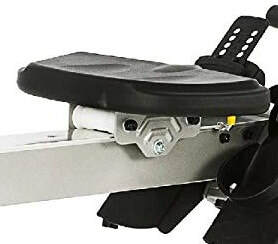 The beam is long giving a full 80" length of travel which makes it a good choice for the tall rower. 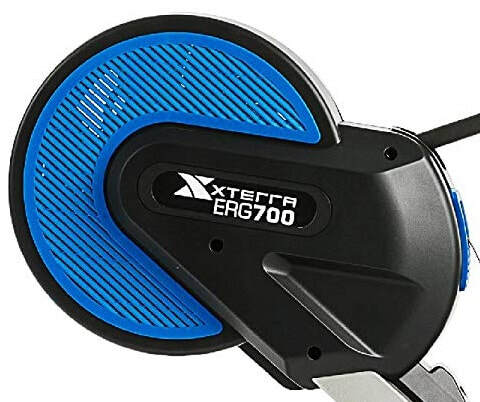 The ERG700 use a combination of air and magnetic flywheel resistance mechanism with 16 levels of difficulty. 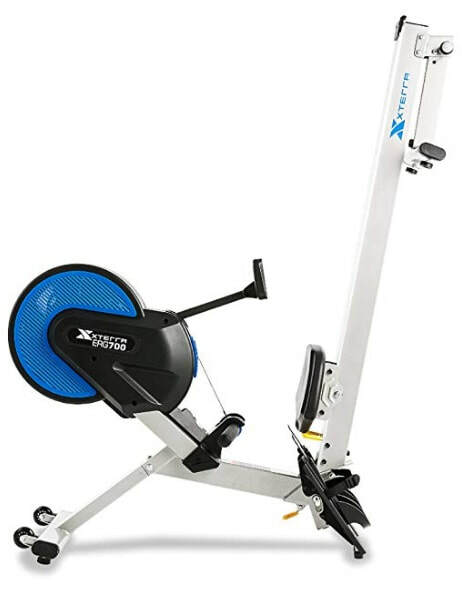 This delivers a slightly quieter machine than purely air, plus it gives a smoother row with no dead sports (that's when the resistance drops at the end of the cycle). The range between level 1 and 16 is wide enough for the absolute beginner just starting up, and for the elite rower to stay interested. This is a folding machine but it still requires a sizable footprint (53") when in the vertical position. Also note, this rowing machine requires mains power for the monitor as it has no battery function. The 5.5" LCD screen is well-designed making it both easy to read and use. 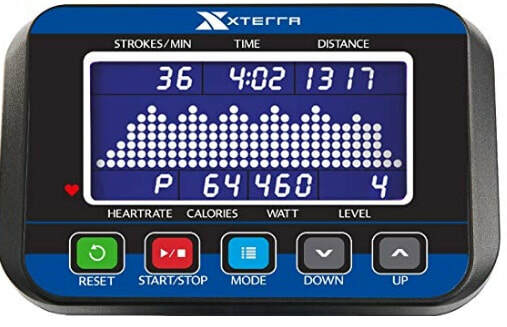 It displays what you'd expect such as distance, calories and strokes per minute, plus your heart rate (but note, a chest strap is not included.). Sadly, it doesn't have heart rate training programs, but it does display watts. This means you can do Tabata workouts used by elite rowers (also known as Wattage workouts). These are great for developing optimum fitness - but be warned, they're quite a challenge! Putting the lack of heart programs aside, it does have an impressive 10 preset programs including Interval, fat burn, cardio and strength workouts. You select the mode, your goal, press the button and the monitor does the rest. 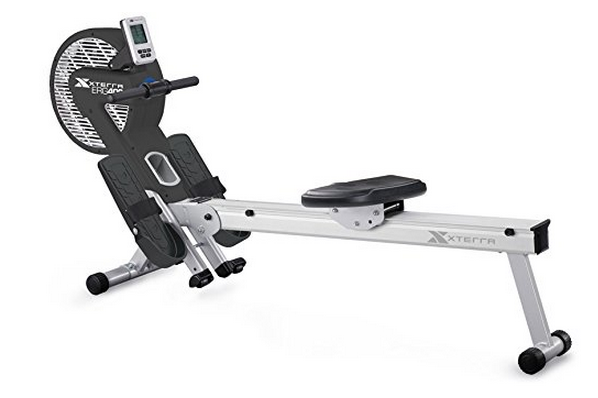 The Xterra ERG700 is a fine rowing machine with some great features, but its price tag puts it in direct competition with the best-selling rowing machine of all-time, the Concept2 Model D. And as good as the Xterra is, it's impossible to recommend it over the Concept2 with its added online features. 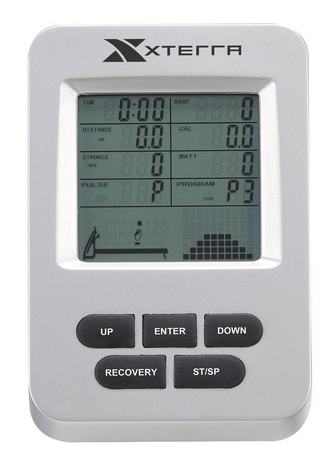 As mentioned above, the Concept2 is the most obvious competitor in this price range.